Location: Bishopton Village, County Durham, England. Notes: Bishopton Castle was a mediaeval castle in Bishopton Village, County Durham, England. 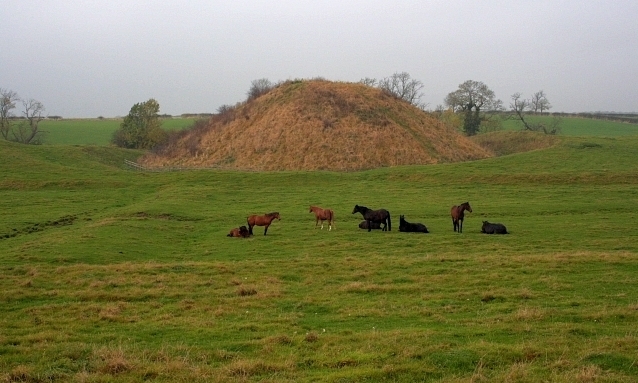 The surviving motte is a Scheduled Ancient Monument. Bishopton Castle was built by Roger de Conyers in 1143, in the village of Bishopton, near to the town of Darlington. Constructed in a motte-and-bailey design, the castle had two baileys, rather than the usual one, and originally had two large enclosures beyond the baileys. In the 12th century it was surrounded by a low artificial lake, fed by the brook to the west, and could only be accessed by causeways. De Conyers built the castle during a dispute with William Cumin, who laid claim to be the Bishop of Durham; de Conyers supported Cumin's rival, William of St. Barbara. Historian Lise Hull believes that the licence to crenellate given to de Conyers for his castle may be the first recorded instance of this in England, but Philip Davis rejects the licence on the grounds that the fortification was a matter of necessity rather than consent, and that the supposed licence contains no indicative wording. In later years the castle became owned directly by the Bishop of Durham, a powerful regional landowner.